Nick Clegg has a rather extraordinary post at the Telegraph today. The second half of the post is pretty standard: the Libdems are less spendthrift than Labour and less ideologically anti-state than the Conservatives. Split the difference and aim for the sensible centre. But in order to grab the opportunity to reiterate this message he has to find a hook to hang it on. And the hook that he – or, presumably, someone in his team – chose was the Greek election. He makes some comparisons between Greece and the UK in 2010 when the current UK coalition was formed. In doing so he resuscitates some myths about the state of the UK economy and, therefore, makes some implausible claims about the role of the Libdems in government. 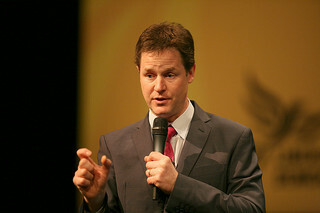 He suggests that it was only the Libdems’ willingness to enter coalition with the Conservatives in 2010, at a significant cost to the party, that brought the stability to UK government necessary to stave off a Greek-style economic meltdown. I genuinely thought no one outside the Conservative party would have the nerve still to be using that line. It implies either they understand nothing about macroeconomics or that they are willing to say anything at all – however incredible – for political purposes. Pretty much everyone who understands the situation would say that there are many reasons – most notably that it has its own currency and much of its government debt wasn’t in imminent need of refinancing – that meant that the UK economy was in a completely different place to the Greek economy in 2010. The persistent use of the analogy with Greece is a rhetorical device simply used to alarm the unwary and inattentive. The formation of the Coalition was an act genuinely undertaken with an eye to the public interest, fully aware that it would do damage to the party’s interests. Considerable credit is surely due for that. Clegg doesn’t need to make these sort of implausibly extravagant claims to have saved the UK from disaster, especially not if they are nothing more than a “convenient” rhetorical hook to allow the reiteration of a basic campaign message. Doing so just makes him look hubristic and more than a little detached from reality. The first part of the proposition may be credible, but I’d need very strong evidence to be convinced of the second. Do you see that statement as contentious? I was just referring to the point that coalitions tend to be harsh on the junior partner – which I would have thought was pretty well recognised, even back in 2010.